Paul Blondeau is an artist whose life and career patiently await exploration. So few details have been uncovered – even his exact birth date is unknown - that his oeuvre is difficult to analyze vis-à-vis the context of his personal experiences. While this lack of information impedes a complete understanding of Blondeau and his work, what can be deduced solely from his oeuvre is that he was part of the later generation of Naturalist painters in France, perpetuating the image of the peasant and an interest in landscape painting. Blondeau’s work gains relevance when viewed in relation to his colleagues and the unstable artistic environment in which they worked. The image of the peasant was popularized in France during the mid-nineteenth century through the works of artists such as Jean-Francois Millet and Jules Breton. In its earliest years, the image of the peasant was linked to imagery that adhered more prominently to the tenets of French Realism. Artists, such as Millet and Breton, for example, concentrated their efforts on depicting the struggles, hardships, and desperation of peasant life in an attempt to make political and moral statements on their behalf. They were examples of the harsh realities of peasant life, unflinchingly represented in all of its desperation. As the decades passed, the reality of the peasant had become almost over-represented, and a new manner in which to record the life of the peasant was required – one that was more lighted hearted and which appealed to a larger audience base. Initially falling under this banner of Realism, a new trend called Naturalism was introduced during the 1870s which signaled a change in the representation of such scenes as the peasant. Both a literary and visual movement in the arts, it was spearheaded by the writings of Emile Zola. For visual artists, Naturalism was related to a depiction of both rustic and urban life, “based on an objective rendering of facts and a highly standardized, impersonal attitude, which made it possible for painters to share their method with other artists.” (Gabriel P. Weisberg, Beyond Impressionism: The Naturalist Impulse, New York: Harry N. Abrams, Inc., 1992, pg. 8) While popular with private patrons, Salon audiences, and the government alike, it was condemned by “Modernists” seeking to challenge pre-established traditions. …veered away from socially upsetting themes or subjects charged with radical implications. Those who defiantly presented morally difficult ideas or focused on the indigent often found no buyers. No one wanted to collect a Naturalist image of hard times. Consequently, paintings of daily life, even labor in the fields, were often apolitical. Naturalism as a style peaked around 1889 at the Exposition Universelle, but extended into the late 1890s and even into the early twentieth century through the works of artists like Blondeau. His peasants in the field are anything but visually fatiguing. 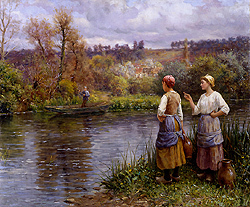 His pastel color palette and often sketchily executed landscape background may suggest a slight influence from earlier Impressionists artists, but more likely are evidence of the influence of the American expatriate artist, Daniel Ridgway Knight, a former student of Alexandre Cabanel at the Ecole des Beaux-Arts. Blondeau worked alongside Ridgway Knight and his son Louis Aston Knight at Ridgway Knight’s studio in Rolleboise, a small town about forty miles west of Paris. As was common during this period, Ridgway Knight had a glass studio constructed as part of his home, which allowed him, and most likely Blondeau, to be able to paint conveniently while still being able to provide the impression that they were consistently working en plein air. Blondeau’s work suggests he was most influenced by Ridgway Knight’s work; however, he was a student of the Ecole des Beaux-Arts and worked in the atelier of both Tony Robert-Fleury as well as Jules Lefebvre. Prior to working alongside Ridgway Knight and focusing on the theme of the peasant, Blondeau began his career as a watercolorist, debuting at the Salon of 1898 with a watercolor entitled Moulin de Dennemont (Dennemont Mill). Indeed, Emmanuel Bénézit, in his Dictionnaire Critique, referred to Blondeau as a watercolorist, neglecting his substantial work in oils completed in the early 1900s. At the time of his first Salon showing, Blondeau was living in Paris and was then a student of only Robert-Fleury. His early Salon entries suggest that he began his career with an interest in landscape painting and that it was most likely under the influence of his later teacher, Ridgway Knight, that he turned more towards the peasant scene. He continued to submit watercolors to the annual Salon, exhibiting Bras de Guernes (The Works of Guernes) in 1899, the same year he also began studying with Ridgway Knight. Between 1901 and 1902 he was elected to be a member of the prestigious Société des Artistes Françaises. By the time he exhibited his first painting in 1906, he had moved to Rolleboise. His 1906 entry, Inondation (Flood), earned him an honorable mention. For the next several years Blondeau’s name could regularly be found in the Salon catalog. In 1907 he exhibited Moulin de Saint-Croix (Saint-Croix Mill); in 1908, Coup de Vent (Gust of Wind), in 1909, Septembre en Normandie (Normandy in September); in 1910, Soleil Couché (Setting Sun); and in 1911, La Mare au Diable (The Devil Pond), the title of a novel by the mid-nineteenth century writer George Sand, and Canal du Jardin Public, Venise (Canal of the Public Garden, Venice). He began to concentrate more on his oil works during this part of his career. It is not known when Paul Blondeau died. What is known is that he was born in Paris and died at Rolleboise. Blondeau’s work represents the continuation of a tradition over half a century old. The images by Blondeau that modern-day audiences most often recognize show the influence of Daniel Ridgway Knight on a once-prolific watercolorist. Blondeau’s representation of the pretty peasant girl with rosy cheeks in front of a beautifully rendered landscape setting suggest his academic training and desire to create images simultaneously continued traditions but spoke to contemporary audiences seeking attractive, not challenging, images.